Though it’s one of the fundamental challenges (and appeals) facing film critics to discern individual agency within a collaborative context, 'They Were So Young' has a characteristically radical edge to its storyline that befits Trumbo’s general sensibilities. This text was first published on 'Keyframe' in April 2015. One of the many names—and it really is a great name—that repeatedly crops up in the history of the ‘Hollywood Ten’ is that of Dalton Trumbo, the novelist and scriptwriter who, with nine other left-leaning filmmakers and screenwriters, refused to testify in the 1947 HUAC investigations into communism in Hollywood. Blacklisted thereafter, Dalton nevertheless continued to write films under some form of disguise, including two 1960 epics: Otto Preminger’s Exodus and Stanley Kubrick’s Spartacus. Trumbo’s output also garnered two Oscars, both for Best Story, before that category was scrapped toward the end of the 1950s—though it wasn’t until years later that the Academy officially recognized him as the rightful recipient of each. The first of these was for Roman Holiday (1953), which had been presented as the work of fellow scriptwriter Ian McLellan Hunter (himself later blacklisted) and which was posthumously reattributed to Trumbo in 1992. 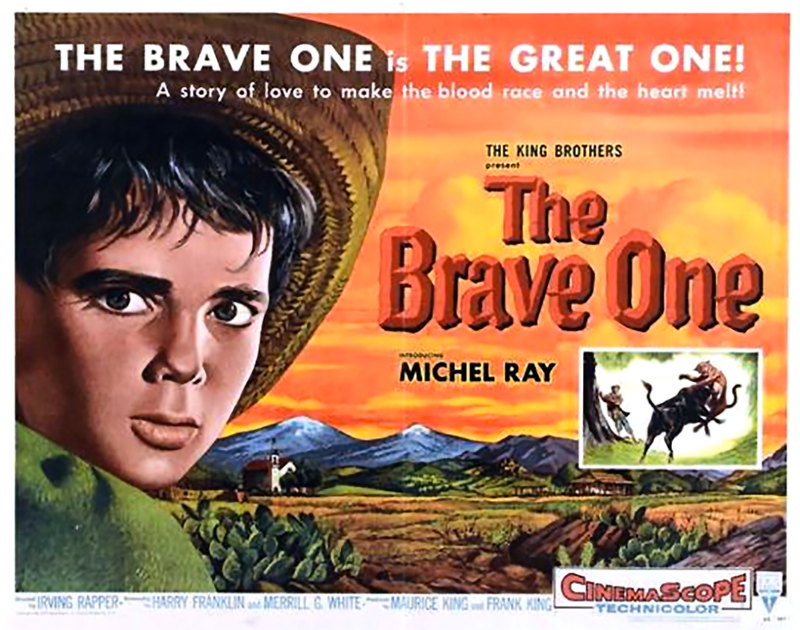 The second was for The Brave One (1956), whose story had been credited to one Robert Rich—Trumbo’s own pseudonym. He was presented with that award in 1975, a year and a half before his death of a heart attack aged 70. Adapted by Harry S. Franklin and Merrill G. White from Trumbo’s ‘original’ treatment (itself nigh-on identical to ‘The Story of Bonito the Bull’, a story by Robert J. Flaherty that had garnered the interest of Orson Welles), the actual script for Irving Rapper’s The Brave One is in fact more interesting for how dull it is. Additionally, its acting is wooden and its dialogue is functional, though Jack Cardiff’s Technicolor vistas—shot in CinemaScope—are frequently a marvel. Its premise, in brief, concerns young Leonardo (Michel Ray), the son of a Mexican farmer who indefatigably endeavors to protect their prize bull Gitano, firstly from the clutches of a ranchman keen to brand it as his own and secondly from a brutal end at the sword of a noted matador in Mexico City. Recalling a formative school lesson about liberal and former Mexican President Benito Juárez (“he always listened to the voice of the Mexican people… no man was so humble that the President did not hear him”), Leonardo frantically searches the city hoping to find the current president in order to get a handwritten letter from him saving the bull from its spectacular death. As one character remarks about something else, it couldn’t be plainer! Preposterously schematic though The Brave One may be, its didacticism is primed—and justified—by the backdrop of Leonardo’s schooling (he is the first in his family to receive a formal education), and the first three quarters of the film seem designed only to make the climactic fourth as moving and tense as it is. This sequence, juxtaposing two scenes in parallel, begins with Leonardo running back and forth in search of the president’s home while the day’s bullfights unfold at the Plaza México, the world’s largest bullring. Its second part is the final showdown proper, between Gitano and the matador. It’s here where the film comes into its own, with the inter-species duel lasting appreciably long enough that it transcends the film’s otherwise plodding predictability to the point at which one can’t really tell what or who will prevail. This is one of the great instances of an ordinary film upping its game when it matters—and what its final tension boils down to is whether or not the few upper-class members of the audience, watching and controlling events from above, will be sufficiently moved by the growing protests from the rest of the capacity crowd in favor of Gitano’s pardon. Such mercy is to be called for and granted by that simplest of gestures: the waving of a white handkerchief. Of course, the crowd’s strength in numbers matter—Rapper switches between close-ups of Leonardo and aerial views of the immense stadium—but they do need a cause to root for in the first place: a great champion, an earthly hero, a brave bovine hulk like Gitano (the name means ‘gypsy’), who earlier in the film demonstrated which side he was on by besting a feline predator preying on him like he was nothing more than someone’s property. They Were So Young, a West German-American co-production directed by Kurt Neumann in 1954, is by contrast a much leaner, more direct and overall more gripping film. Trumbo worked on it uncredited with fellow blacklisted (and similarly uncredited) scribe Michael Wilson. The two names officially credited on the film are Neumann and Felix Lützkendorf. Though it’s one of the fundamental challenges (and appeals) facing film critics to discern individual agency within a collaborative context, They Were So Young has a characteristically radical edge to its storyline that befits Trumbo’s general sensibilities. The film follows Eve Ullmann (Johanna Matz), a 20-year-old German who arrives in Rio de Janeiro on the understanding that she’s to model new fashion designs to wholesale buyers flying in from the US. It isn’t long before she and Connie (Ingrid Stenn), another new recruit from the Netherlands, discover they’ve been duped, and that they’re expected to entertain well-paying clients beyond their sartorial responsibilities. It’s a great film. 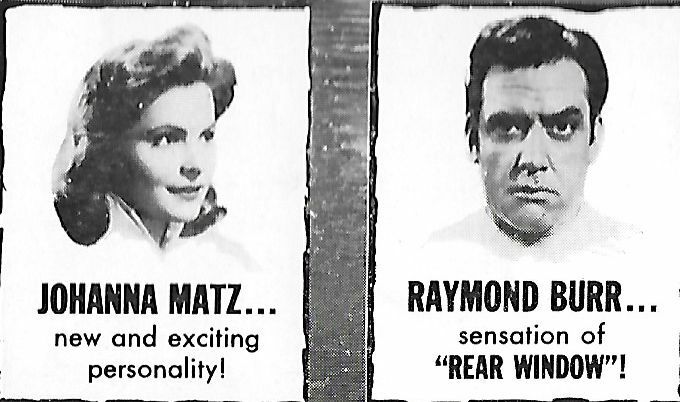 At 78 minutes, it doesn’t waste a moment in wheeling through a number of genres (romance, adventure, prison escape, noir), and it has a very fine performance by Raymond Burr as the suave, white-clad racketeer Jaime Coltos. In Eve, though, the film boldly places all its narrative trust—and Matz rises to the task with relish. Two scenes, two gestures. The first is that in which Eve first discovers Coltos’s scheme, and accordingly wallops another fella over the skull with a vase. That’s a pretty violent gesture by any stretch, but what’s interesting, specifically and generally, is that it plays out in contrast to the male-on-female violence, which occurs either off-screen (a vicious beating) or else somewhat obscured (a fatal stabbing). The point is that under certain conditions, certain gestures become acceptable because they might also seem comically cartoonish: here, the male is a vague threat but he’s also very drunk (later, he turns out to be a good guy). The vase Eve crashes down upon him is like a ceramic custard pie, and it’s a gag as violent as Chaplin kicking a bumbling beat cop up the backside. Though Eve’s eventual escape from Coltos and his cohorts requires help, we have to believe in her—as with Gitano the bull—in the first place. We have to trust, that is, that the assistance she receives quickens her escape rather than determines it—that she’s an active rather than a passive agent. And so the second gesture. Here, Eve is charmed by Richard Lanning (Scott Brady)—the same fella she walloped earlier—one night when the pair of them find themselves in conjoining rooms separated by a roll-down blind. Lanning advances into the adjoining chamber and tries to win Eve over by suggesting he recognizes her from his days in Düsseldorf during the war. Back then, he says, she was a pretty girl to whom he gave some candy. Eve—and it’s all about Eve—denies it: she wasn’t pretty back then and she had freckles. Oh, Lanning says, thwarted. But Eve admits to having been pretty and without freckles all along, that she’s just playing with him, and Lanning feels encouraged enough to feign familiarity with a mole on her chin and he moves in for a kiss, and Eve returns it, charmed and seduced. But not quite: “The mole came later,” she says. The kiss was on her terms all along.